When an army commando’s ex-girlfriend requests him to help her save her daughter from the clutches of kidnappers, he realizes that apart from the drugs and illicit trade, there is an even greater enemy hard at play in the underbelly of Goa. When there’s Indian parkour and gymnastic expert Tiger Shroff at the helm of things, one can easily guess that the movie starring him will be an all-actioner. And with Ahmed Khan wielding the baton, it would be high on the dance quotient as well; but apart from Tiger’s showcase of stunts, ‘Baaghi 2’ is nothing more than a run-of-the-mill story that has more action than emotions put together! Ahmed Khan does everything he can to capture Tiger’s new image in every frame and the action star doesn’t disappoint. The movie starts with a few masked men preparing to launch an attack on Neha (Disha Patani) in the dusty lanes of Goa. The camera then pans into the snow-capped mountains of Kashmir, where a battle-scarred commando Ranveer Pratap Singh aka Ronnie (Tiger Shroff) goes all guns blazing to make sure terrorists stay on the other side of the border. An upright officer, who doesn’t miss a chance to prove his deshbhakti, Ranveer serves his motherland with all his heart and soul (and the audiences wonder what pushed him to the edge!) at any given time. It is then we learn that Neha, who was his former flame, has placed him a call, requesting him to bring her kidnapped daughter back home safely. The story then goes back a few years in time. Both Ronnie and Neha are happy college-goers, madly in love with each other and all excited to spend the rest of their lives together, but their happiness is cut short when Neha’s folks get her married into another family. Heartbroken and dejected, Ronnie joins the armed forces, which gives him the opportunity to vent out his anger and his frustration on the enemies and there’s not one person to question his doing. As Ronnie heads to Goa to execute his plans, he gets enmeshed in deeper mess of drugs, illegal activities and an entire Russian mafia that need to be taken care of before everything else. And all this is just the tip of the iceberg. The next one hour then goes into all the action and the effort, the lead actor puts in to prove his mettle. 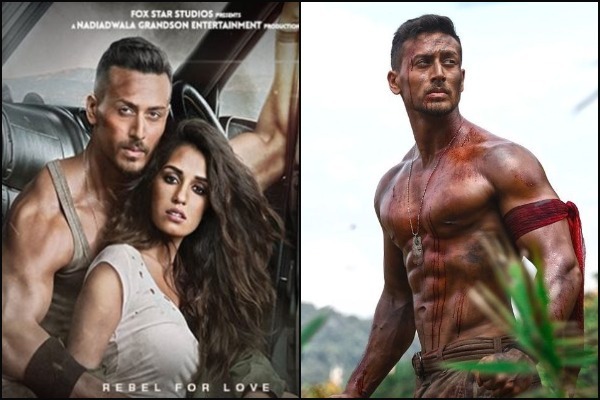 Before going to the positive side of things, what fail to make ‘Baaghi 2’ better than its predecessor are the unnecessarily stretching of the climax, a forced Jacqueline Fernandez number, a pretty but wooden Disha Patani and a waste of talent of the likes of Randeep Hooda and Manoj Bajpayee. Ahmed Khan while focusing on Tiger and his bare body, totally forgot to bring out the best from the rest of the cast, although they do manage to do whatever little they could in their quick roles. Even if the suspense is kept for the end, the predictable plot gives it away way before the audiences break for interval. As for the best part, it is Tiger Shroff who takes the biggest slice of the cake! With an improved set of acting skills, an addition of better dialogue delivery and a swagger that suits him well, the young actor is the lifeline of the movie. Although he doesn’t get many chances to show his softer side, his Rambo-esque action scenes make up for it. The entire focus is on him playing the one-man army, who can round off a large group of enemies single-handedly. He handles bombs, guns, knives and rifles as easily as he handles his romantic side. A toughie with a soft heart, Tiger portrays both his roles convincingly. Technically, the film scores some points. The songs are easy on the ears (though not worth remembering…also, let’s not talk about the Ek do teen number!). The screenplay is skillfully handled and the action choreography is the best part. Cinematography is top class as Ladakh, Goa and the uncharted jungles towards the end are beautifully captured on the cam. Editing could have been a bit crispier, cutting short the length of the movie, but that does not harm as long as Tiger shines bright in it. To put it together, if you have the patience and the heart to watch an out-and-out action film, with Tiger Shroff squaring up to the enemies all alone, ‘Baaghi 2’ is a must watch for you. Rest can give it a miss! Next : Wedding Confirmed: Deepika Padukone And Ranveer Singh Getting Married This Year? Read To Know!